Patting the Returning Officers (ROs) and Assistant Returning Officers (AROs) for smooth and peaceful conduct of the elections for Zila Parishad and Panchayat Samiti, the Deputy Commissioner Jalandhar Mr. Varinder Kumar Sharma today asked them to pull up their socks further for transparent counting to ensure ethos of democracy were further strengthen in the district.Presiding over a meeting with the ROs and AROs here at his office today late evening, the Deputy Commissioner described them as backbone of free and fair elections. He said that the mechanism of elections has been evolved and effectively executed with the ROs and AROs as its basic pillars. Mr. Sharma said that once the elections have been over peacefully now the real challenge for the officers was to ensure smooth counting also.The Deputy Commissioner said that the district administration has already put in place a viable mechanism to ensure that the counting was conducted in a free and fair manner. He categorically said that no one would be allowed to take law in his hand during the counting of votes and stern action would be taken against any sort of unlawful activity. 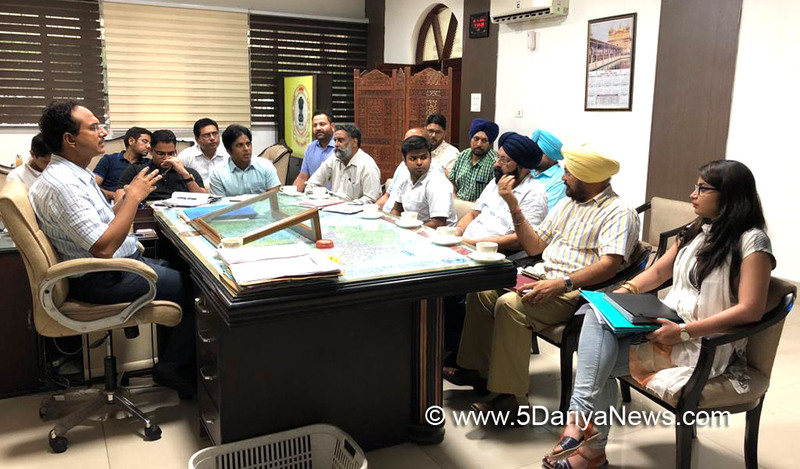 Mr. Sharma said that the district administration was duty bound to ensure that process was conducted in a free and fair manner.The Deputy Commissioner said that entire plan for deployment of staff, counting of votes and even the declaration of results has already been prepared. He asked the officers to ensure meticulous implementation of this plan, so that counting was conducted in a peaceful and transparent manner. Mr. Sharma said that since each and every ballot was to be counted, so results would be declared by evening of September 22.On the occasion Additional Deputy Commissioners Mr. Jitendra Jorwal and Mr. Jasbir Singh, Sub Divisional Magistrates Mr. Paramvir Singh, Mr. Rajiv Verma, Mr. Varinder Pal Singh Bajwa, Ms. Navneet Kaur Bal and Mr. Sanjeev Sharma, Assistant Commissioner Mr. Himanshu Jain, Additional Chief Administrator JDA Mr. Darbara Singh, Executive Magistrate Dr Jai Inder Singh, DIO Mr. Amolak Singh Kalsi, Revenue Officers Mr. KS Bhullar, Mr. Tapan Bhanot, Mr. Inder Dev Singh and others were also present.